Have you heard of a travel nurse? 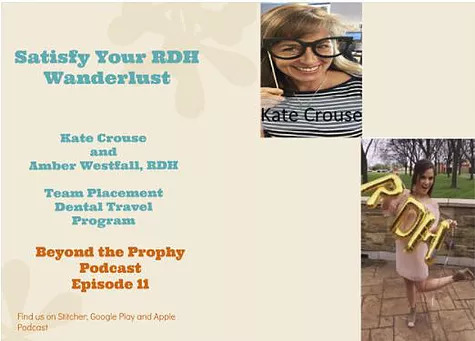 Did you know that a travel RDH program exists? Meet Kate Crouse the Dental Travel Coordinator at Team Placement and Amber Westfall, RDH, a current RDH in the travel program. It was awesome getting to know Kate and Amber. We hit it off right away and the program they offer is one not to be missed!! Educators and RDHs share this episode with anyone you know! Listen in to hear about this innovative program and how you could possibly participate if you are ready to expand your clinical practice. How many RDHs in this proram? How many RDHs are they looking for? The length of the program and terms. Full housing and board for candidates who are accepted! Let's start the discussion. Did you have any aha moments or favorite quotes? Do you agree with the tips? Don't forget to subscribe to our newsletter, podcast, and leave a review!